Once back at Crystal Cove, we deployed our new buckets and spades as we ventured out on to the beach for some rock-pooling. We caught lots of hermit crabs and then managed to catch some tiny fish which we put in the buckets (in some sea water, obviously – they were far too small to eat!) so we could watch them. The girls were fascinated. We also found lots of anemones open like flowers and watched them try to catch on to the things we tickled them with and close up. It’s funny how you can spend hours on the beach, day after day, and it’s still fascinating – as much to us as the girls. The holiday is reminding me of lots of time spent in Cornwall, climbing rocks, paddling and exploring rock pools. Perfect childhood stuff and the girls seem to agree. They couldn’t be happier. 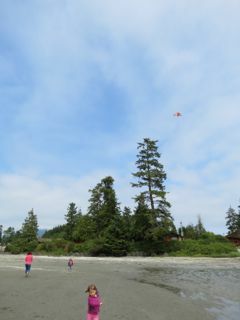 My Lovely Husband bought a kite yesterday and today the girls got to fly it. The Big One took this responsibility seriously and listened carefully as my Lovely Husband explained what she had to do. The Little One was a bit more relaxed about the whole thing. Most of the time she didn’t even look at the kite – she just presumed it would stay up there in the sky! You can just see the kite above the tallest tree. The Little One is watching something else on the beach! After hours on the beach, we walked up to a fish and chip take away (the Wildside Grill) for the loveliest fish and chips we’ve ever had. The fish was caught fresh this morning and cooked to perfection. We also had some local prawns which were delicious too. This was followed by locally made ice cream from Chocolate Tofino, which was also superb. A last play on the beach and then it was time for bed. All that food and fresh air is exhausting!